WASHINGTON – The United States Mint (Mint) will release the second America the Beautiful Five Ounce Silver Uncirculated Coin™ of the year on April 13 at noon Eastern Time (ET). 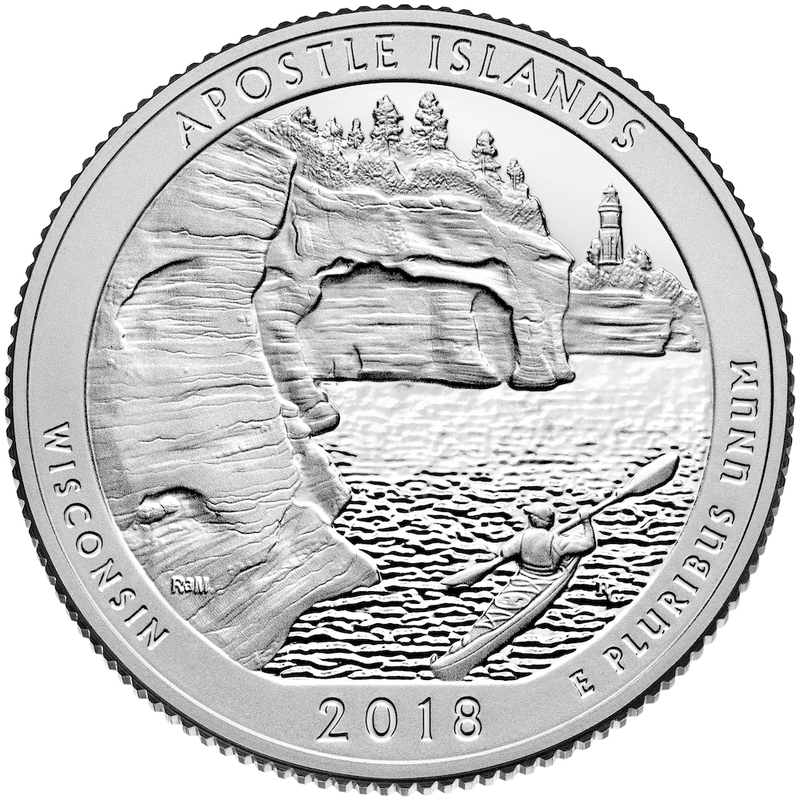 The coin (product code 18AK) honors Apostle Islands National Lakeshore in Wisconsin. The Philadelphia Mint produces America the Beautiful Five Ounce Silver Uncirculated Coins™ in .999 fine silver. They measure three inches in diameter. The reverse (tails) design representing the Apostle Islands National Lakeshore depicts the sea caves at Devils Island with the lighthouse in the background and a kayaker paddling in the foreground. Inscriptions include “APOSTLE ISLANDS,” “WISCONSIN,” “2018,” and “E PLURIBUS UNUM.” The obverse (heads) features a 1932 restored portrait of George Washington by John Flanagan. Each encapsulated legal tender coin comes in an attractive presentation case with a Certificate of Authenticity. The Mint has priced this coin at $154.95. The maximum potential mintage limit for the America the Beautiful Five Ounce Silver Uncirculated Coin™-Apostle Islands National Lakeshore is set at 20,000 units.